We are spreading kindness this month through our 100 Acts of Kindness project. We are challenging our readers to perform 100 acts of kindness between Jan 16th and Feb 14th. You can read more about our kindness challenge here. Many of our blogging friends have joined the challenge and will be sharing ways that you can spread kindness here and on their blogs. Today we have Mikilani as our guest blogger. She is a super creative friend of EJ's and we are excited to have her posting today. She is sharing an adorable project that she created with her sons. Welcome Mikilani! In my opinion, nothing beats a homemade valentine! A few years ago I made a card for my husband using my nine-month-old son's footprints. This year I decided to revisit this technique and allowed my son (now almost three) full creative control of the project. First, he colored one foot with a washable red marker (you could also use washable paint or a stamp pad). The marker is very ticklish so you may find your child erupting into fits of giggles during this step. Next, he made the first half of the heart by standing firmly on a piece of paper. We then carefully peeled his foot off and quickly washed it with baby wipes, and repeated this process on the other side. Be sure to help your child carefully position his second foot to create the heart-shaped print. We also made thumbprint and pinkie-fingerprint hearts (the small ones pictured above) and handprint hearts (pictured below). My older son really enjoyed this project too, making his heart prints in pink to compliment the red. Both boys worked together to customize an oversized card for dad that will be waiting at the breakfast table on Valentine's Day. In the book, the little boy makes valentines for the special people in his life - his cat, mom, dad, sister, grandma, teddy bear, favorite tree. 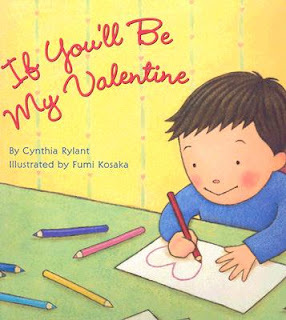 After we read the book together, we talked about who is important to us and who we should give our valentines to. This year both our preschool friends and Thomas the Tank Engine friends made the list. Once the heart prints are dry, it's time to make copies. Instead of having the boys make multiple prints for multiple cards, (that would be beyond my preschooler's attention span), I printed color copies on card stock for additional valentines and the kids' scrapbooks. It was fun to sit down with my preschooler and compare his footprint hearts from different years. *Fair warning: Depending on which brand of marker and what color you use, you may have little stained hands and feet which can take a few washings to completely get rid of. Lighter colors (like pink and yellow) clean up much easier, but my boys always want to do red, so the color tends to linger. Alternatively, if you want to avoid this, you can trace your child's feet (and hands) onto a piece of colored paper and use the cutouts to make your hearts. Mikilani is a Jill-of-all-trades mom who has traveled from coast to coast with her family and is still up for more adventure! This spring, she will spend three weeks in Japan with her family on the ultimate field trip. What a beautiful project! Your son's list is adorable too. What a great activity to do as you make connections with the book. I also love the color copying idea. I will be using it. Thanks Mikilani! Do any of you have any special Valentine's day creation that you've made? We'd love to see them, so share a picture or link to them on our Facebook wall today. These came out so cute!! They will be well treasured this valentine's day!! I hope you can join in on the fun!!! I love these! We did a hand/fingerprint bouquet this week but we are going to have to do the feel this weekend for sure!